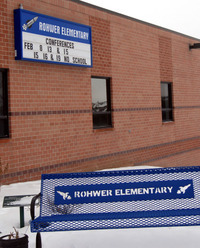 What a wonderful day working with the Second and Third grade students at Rohwer Elementary in Omaha. A full day in Scribner, as grades K-12 took a wondrous journey with me around the world. Many thanks to the Scribner-Snyder Spirit Boosters and the PTA for sponsoring my day. This was the selected A team who I had the privilege of sharing lunch with. Out of the submitted essays, these six students had the best papers, which allowed us to have some extra time together asking questions and sharing more stories.